Herbal support for urinary tract function and bladder control. Give daily to help maintain and support urinary tract function. Concentrated, only requires a small drop amount. Just add to food, drinking water or treat. A combination of liquid botanical extracts, traditionaly used for bedwetting and incontinance. 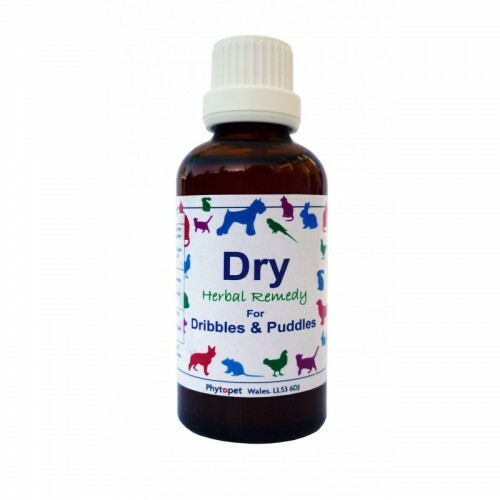 Use daily to help support urinary tract function and help prevent dribbles and puddles. A traditional remedy for urinary tract disorders, its antiseptic, diuretic and astringent properties makes Shepherds Purse a must in any incontinence mix. Herbal specific for incontinence, frequency, enuresis and haematuria (blood in urine). Its actions are styptic, haemostatic, astringent. Traditionally used for Cystitis and other urinary tract disorders due to its soothing healing action. Rich in silica which aids tissue repair and helps to preserve the elasticity of connective tissue. A good astringent with a traditional use for incontinence. An excellent calmer. A proven remedy for anxiety and stress, enuresis, dribbling and incontinence can all be symptoms of stress. Carrots, garlic and potatoes mixed in to food, Slippery Elm powder mixed into water then added to food. Keep meats to a minimum until symptoms disappear. Vitamin C (preferably Ester C) with bioflavonoids. Vitamin C enhances immune function, bioflavonoids enhance Vitamin C absorption. High doses, 100-500mg 2-3times per day. A good balance of omega 3, 6 and 9 Essential Fatty Acids. EFA’s play an essential role in most functions of the body, however, they could prove useful in this instance, due to their effect on the membranes of the urinary tract. Herbal support for stamina & lethargy, recovery from illness.Fast acting, Liquid Botanical Extra..